On Wednesday, an Egyptian court sentenced twenty one women, including girls as young as 15, to heavy prison terms for taking part in anti-Coup protests last month, a case that has caused great alarm among civil rights campaigners. Ceasefire's Alessandra Bajec reports from Alexandria and Cairo. 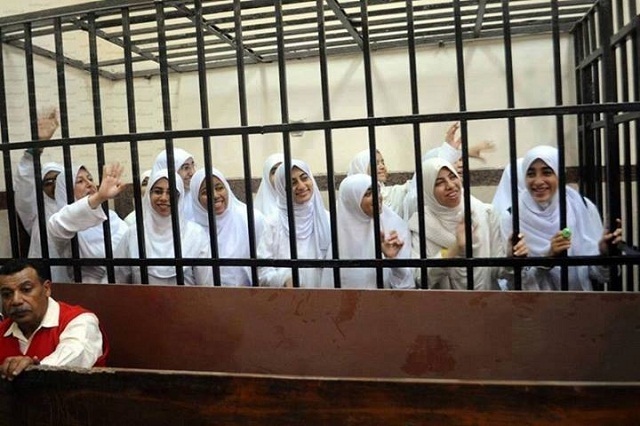 Twenty one women, including girls as young as 15, were handed down heavy prison sentences by Alexandria’s Misdemeanour Court on Nov 27, after being arrested at the end of October for protesting against the military’s July 3 ouster of President Morsi. The Egyptian court sentenced fourteen women – most of whom aged 18 to 22 – to 11 years and one month in prison, and seven female minors – aged 15 to 17 – to juvenile detention until they reach the age of majority. The tough verdict marks another setback for freedom of expression in Egypt but also an unprecedented step by the new leadership to take women out of the political scene. Ahmed Shazli, head of the Alexandria branch of the Egyptian Initiative for Personal Rights (EIPR), couldn’t find the words to comment on the verdict when he came out of the courtroom. For him, the sentences essentially condone the imprisonment of protesters for expressing dissent, and hints at a comeback to Mubarak-style autocratic regime and oppressive practices. The 21 female defendants were convicted of several charges, including damaging public property and stirring violence. In addition, six men – who are said to belong to the Muslim Brotherhood leadership in Alexandria – were sentenced to 15 years in prison for instigating violence during the protest. Shazli decided to document the case after he heard about the arrest of the 21 women, which he termed a violation of personal and civil rights as well as of gender equality, especially as they involving the arrest of minors. The young women are part of ‘7 am’, a youth movement launched last month in Alexandria that holds protests in the early morning -before school starts- against what members describe as the military coup that led to Morsi’s overthrow. The girls were arrested on Oct 31 during a demonstration near Stanley Bridge, on the Alexandria Corniche, when protesters formed a human chain before they were attacked by security forces. They were subsequently transferred to the Alexandria Security Directorate, where they were brought before the Public Prosecution. The adults were sent to the Damanhour women’s prison while the minors were placed in the Defense Care Facility in Muharram Bek. One young man was also arrested but released soon after, as the police reportedly established he had no connection with the ‘7 am’ group. Defence attorney Ayman Dally got involved in the case as one of the detainees is his niece. He recollected from testimonies that security forces intervened with six armed vehicles to separate demonstrators from the crowd – a well known military tactic- leading to police cruisers arresting the girls, some at gunpoint. Dally pointed out that this was a joint operation carried out by both the police and the army, inviting us to watch YouTube videos which prove this. The general prosecution charged the women with belonging to the recently banned Muslim Brotherhood, promoting ideas of the group, possessing and distributing flyers inciting violence, assembly, threatening violence, obstructing public transport and vandalising properties. A statement by the Prosecutor General said the defendants had denied the charges against them. As EIPR representative, Shazli condemned the arrest of the 21 women, stressing that the right of peaceful assembly is a fundamental right of every citizen. He dismissed the allegations as based on fabricated police reports, adding that such practices are aimed to exclude women from the public space through direct targeting. EIPR’s director expressed deep concern over the unprecedented mass arrest of female protesters. Dally also drew attention to a number of bizarre incidents following the arrest, such as the quick transfer of the women from the Alexandria police station to prison as their lawyers were lodging appeals – later rejected – against their detention; the sudden appointment by the Minister of Justice of a new judge, who took over the case and denied the lawyers access to the court at the juvenile facility; and the prolonged custody of the defendants. On Nov 12, Alexandria prosecutors extended the detention of the women for a further 15 days, pending investigation. Attorney Dally rejected the “false” accusations. Moreover, while acknowledging the power of the authorities to set measures of public order, he argued against the use of ‘illegal methods’ under the cover of a ‘legal makeup’, to oppress citizens who gather peacefully and express their opinion. “In no circumstances, can these girls be seen as terrorists or criminals”, Dally stated. The lawyer also lamented the repeated delays from the public attorney office in providing a copy of the case file to the court. The file was received a day and a half before the trial on Nov 20, which gave the defence team a very limited time to review the case. The judge himself received the case on the morning of the trial. On the day, the police did not bring the defendants to court, citing ‘security reasons’. Unable to try the girls in their absence, the court finally decided to postpone for another week. A collection of lawyers from four human rights organizations, private lawyers and lawyers assigned by parents of the detainees worked on the case, standing for the right to freedom of expression for all. In Dally’s view, the detention of the women was a well-planned “setup”, designed by some high-ranking security officers to specifically target women and prevent others from coming out and demonstrating. “The outcome is, nevertheless, the opposite”, the lawyer insisted, “we see more women, not less, in the streets”. He called the targeting of the women by security forces a ‘mistake’, suggesting there’s already some resentment in the police department, since this case will spark a lot of anger in Egypt, where women are a ‘red line’. I also spoke to Hatem, an Islamist activist in Alexandria, who is acquainted with the girls in ‘7am’. He apologised for not being able to bring any of them, saying they were scared to go into town and risking arrest by police. The fact that 21 women were arrested, yet no man was detained, is something new to Egyptians. Hatem explained that women have played a big part in anti-government protests since after the ouster of Morsi, their large participation has in turn prompted security forces to respond with repressive methods. Which has, instead, generated greater determination among women to continue protesting. In his opinion, female protesters were deliberately convicted to scare women off, and thus silence an active part of society. “What’s shocking is that for the first time young girls have been detained in Egypt”, the activist commented, “it’s totally unacceptable”. The conviction of the 21 women comes amid other ongoing violations committed by security forces against freedom of expression. Earlier this month, 12 university students were sentenced to 17 years in prison over riots at Al-Azhar University drawing criticism over the harshness of the sentencing. Egypt’s authorities have cracked down hard on Islamist backers of ousted President Mohammed Morsi. Security forces have recently moved against secular youth activists opposed to the military and police. Update – Friday 29 Nov: Al Ahram Online is reporting that a spokeswoman for Interim President Adly Mansour has confirmed he is considering interveming in the case of the 21 women, but only once the final verdict – after all appeals have been exhausted – has been reached.